I’m young – why should I make a last will and testament? Last wills and testaments deal with the distribution of assets after death, so most people think of them as an end-of-life issue. Why would someone in the prime of life want to think about what happens after their death? We all hope to live a long and productive life, but sadly sometimes fate intervenes. And even if you reach your four score and ten, you still want to be sure your property goes to the beneficiaries of your choosing. If you die without a valid will you have no say in what happens to your estate. Your ‘estate’ is the legal term for your assets, which include your house or flat (if you own it), your savings and investments, and your personal possessions. If you die without a will you are said to be ‘intestate’. The ‘Rules of Intestacy’ will divide your estate in a way set out by law and it may not be distributed the way you wish it to be or to the people you most want to benefit. It also may not be carried out in the most tax-efficient way. What this means is that if you live with someone, even if you are married or have step-children, they may not automatically inherit your estate. If you are a parent of a minor child or children it is particularly important to have a valid last will and testament. In addition to ensuring that your assets are distributed according to your wishes, your will sets out your intentions for the care of your children should you die before they reach 18. If you are married you might presume that your surviving spouse will retain custody, but you must make provision for your children’s welfare should something happen to the pair of you. It is, thankfully, extremely rare, but tragic accidents do sometimes happen. The nomination in your will of a legal guardian will at least spare your children the trauma of being made wards of court while a guardian is appointed on top of the tragedy of losing their parents. If you are a single parent it is all the more critical to name a guardian, particularly if you have reason to believe the non-custodial parent would not be a suitable full-time caregiver. These matters are never pleasant to contemplate or to discuss but it is important to sit down with family members or close friends, as appropriate, and agree how your children will be looked after in the event of your untimely death. Second to the death of a child, dying while their children are small is most parents’ worst fear, so having legally documented plans in place can provide the peace of mind you need to forget about it and get on with living. How do you make a last will and testament and why should you use a lawyer? There are many do-it-yourself templates online that theoretically enable you to create your own last will an testament free of charge. In fact you could just write your wishes on paper and have it witnessed. However, trying to make your own will without legal assistance is not a good idea. You may make mistakes or there may be a lack of clarity and this could mean that your last will and testament is invalid. If you have a number of beneficiaries and your finances are complicated, it is even more important that you get a professionally trained attorney to create your will. This makes it easier for those you leave behind and guarantees your intentions will be properly expressed and executed. When should you update your last will and testament? How do you find a lawyer to help you make your last will and testament? Not all lawyers specialise in estate planning and the drafting of wills. Even if you have a family lawyer or an attorney who has represented you for legal matters in the past, it is worth checking if they offer a will-writing service and what their fee is. 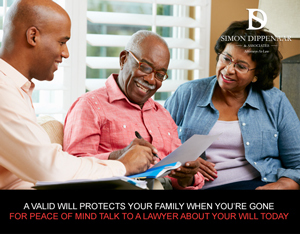 Simon Dippenaar and Associates are specialists in family law and can help you draw up your will to ensure your estate is distributed and your children are cared for exactly the way you would like after your death. Contact Simon now on 086 099 5146 or email him on sdippenaar@sdlaw.co.za to discuss your needs. This entry was posted in Wills and tagged Last Will and Testament, Wills. Bookmark the permalink.